Yang Zili in China, Truong Quoc Huy in Vietnam and Arash Sigarchi in Iran are just three of 61 cyber-dissidents and bloggers currently imprisoned worldwide because they expressed themselves a little too freely according to their countries' overtly strict censorship laws. On Tuesday, thirteen of the worst offenders were named by human rights group Reporters sans frontières and, for 24-hours, the online community has been urged to register their opposition to censorship with a simple click. The 13 "enemies of the Internet" are, alphabetically, Belarus, Burma, China, Cuba, Egypt, Iran, North Korea, Saudi Arabia, Syria, Tunisia, Turkmenistan, Uzbekistan and Vietnam. Freedom of expression is the cornerstone of Ovi magazine and we believe that everybody should have the right to express an informed opinion without fear of imprisonment, censorship or personal harm. We have heard stories recently of Finns having their lives threatened by fellow Finns because of their out-spoken opinions, which shocked and saddened everybody at the magazine. Many of the contributors at Ovi have worked in various media that also wanted to curtail their views, which is one of the reasons we now exist. Every month we analyse our site's statistics to improve our content, but one of the most interesting results is the countries from which our readers originate. After seeing the 'Dirty Baker's Dozen', I was curious to see if any of those countries have visited Ovi over the past seven days. I was surprised to see three: China, Iran and Vietnam. Whether the visits have come from the fascist net administrators of those countries fuming over our opinionated content or from the online resistance fighting them, we welcome you all. When you read how much effort goes into keeping the population of these thirteen countries offline or controlled you don't know whether to cry or scream. You would think that China is the worst offender, but when you read that computers in Burma's Internet Cafés automatically execute screen captures every five minutes and Syria systematically tortures and subjects cyber-dissidents to inhumane conditions, you don't know how to react. Unlike China, Saudi Arabia does not hide its online censorship, Cuba has less than 2 per cent of its population online and Turkmenistan has less than 1 per cent online, while Iran boasts of filtering 10 million “immoral” websites - we hope that Ovi magazine is one of those. Uzbekistan's President Islam Karimov blocks access to most independent websites and Tunisia's President Zine el Abidine Ben Ali’s Internet policies are among the most repressive in the world. North Korea is North Korea and is the world’s worst Internet black hole, but you can help the North Korean journalists who run the www.dailynk.com website. Apparently, the Vietnamese government is negotiating admission to the World Trade Organisation and it is easing up on its control…slowly. This year, ten people were arrested for Internet content and four are still detained. Hopefully it won't be long before Vietnam can join Libya, the Maldives and Nepal as a country that has been removed from the list of Internet enemies. Finally, we have China. 52 people currently imprisoned, the world’s most advanced country in Internet filtering, very few of their 17 million bloggers dare criticise the government, armies of moderators clean up blogging content and they have Yahoo! and Google kowtowing to their demands. Yahoo! was the first to agree to censor its search engine to satisfy the Chinese authorities and they have been collaborating for years with the Chinese police. Ovi magazine is a keen supporter of Reporters sans frontières and other human rights groups that fight these countries, not only against their online censorship, which is why we carry them in out Partner's Page. 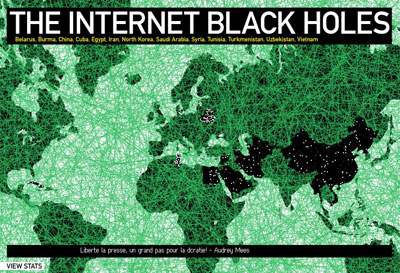 You can join the 24-hour campaign by visiting the Reporters sans frontières website and clicking on an interactive map of the world to help make the Internet black holes disappear, plus, you can record a message for the founder of Yahoo!